Jonah Lehrer sells new book about love (updated). Update, June 6, 7:38, p.m.: Sources tell Slate that Lehrer’s book has been sold to Simon & Schuster. Now, four months after a public appearance that BuzzFeed optimistically described as his “final humiliation,” Jonah Lehrer is ready for his comeback. Slate has learned from sources in the publishing industry that the once-celebrated writer is now shopping around a book proposal on the science—and perhaps the redemptive power—of love. Duckworth defines grit as “perseverance and passion for long-term goals,” which are surely Lehrer’s defining traits. Less than a year ago, the writer was excoriated for “self-plagiarism”; in July, he admitted to fabricating Bob Dylan quotes for his best-selling book, Imagine, and resigned from a staff position at The New Yorker; later that summer, an extensive array of his journalistic misdeeds were further explicated and exposed. These humiliations might have sent another man into long-term hibernation. Lehrer, however, re-emerged in February for a speaking engagement at the Knight Foundation, where he tried to apologize for his earlier indiscretions. That speech, and the $20,000 he earned for giving it, ended up making a lot of people very angry. 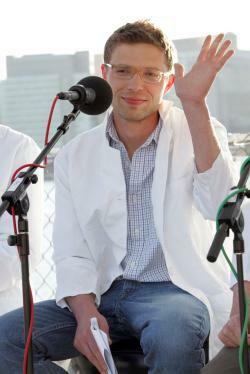 But Jonah Lehrer stayed the course. “Woody Allen famously declared that ‘Eighty percent of success is showing up,’ ” explained Lehrer in a 2011 post for Wired. “Grit is what allows you to show up again and again.” That’s the point that Lehrer has been trying to make for years; now he’s leading by example. You can knock him down, but Jonah Lehrer will get back up. You can pulp his book, but Jonah Lehrer will write another. When news of the made-up Dylan quotes emerged, and Houghton-Mifflin pulled unsold copies of Imagine from the shelves, a less gritty writer might have switched careers and pursued another calling. But Jonah Lehrer knows a secret: Success only comes to those who have the perseverance to pursue it. “Woody Allen famously declared that ‘eighty percent of success is showing up,’ ” he’d written on page 232 of Imagine, in explaining how a successful high school “teaches kids how to show up again and again.” You’ll never win unless you try—and try repeatedly—to achieve your goals. “Woody Allen famously declared, ‘Eighty percent of success is showing up,’ ” Lehrer emphasized in a 2011 article for ESPN the Magazine. “And grit is what allows you to show up, again and again and again.” In spite of all the snark and opprobrium, because of all the snark and opprobrium, the writer and his representatives at the Wylie Agency would not be cowed into quietude. Jonah Lehrer will rise again. Jonah Lehrer has plenty of grit. Will he find love again?